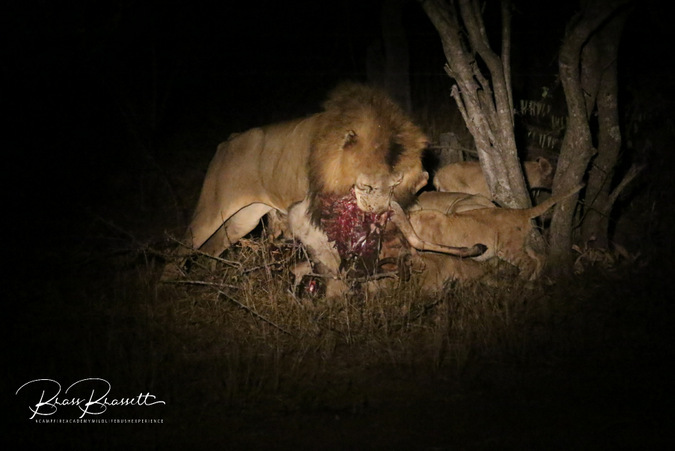 Late on a Sunday night, not too long ago, a pride of lions chased, took down and devoured an impala inside our camp (which is surrounded by high-rise electric fences to keep the elephants out). It all began after a long day at camp after the lights had gone out and everyone had turned in for the night. 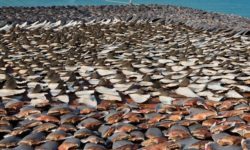 Over the silence came a low, familiar noise, that was suddenly drowned out by whooping hyenas, so loud that they must have been in camp! 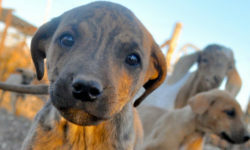 I stood on my stoep (porch), spotlight in hand, but could see nothing… and then the familiar noise came again. 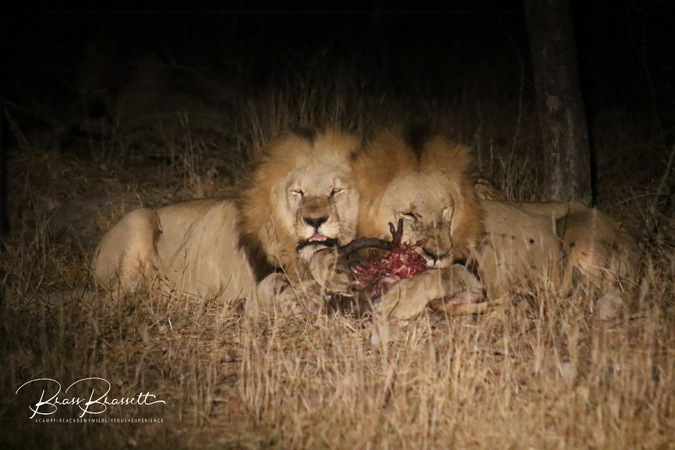 A few steps out and shining about 100 metres down from my house, there they were: lions feeding on a kill – inside the camp! This was too good an opportunity to miss for our trainee Nature Guide students. So each student was woken and picked up at their door and off we drove to view the sighting. 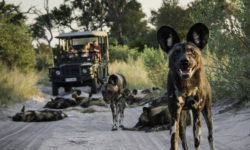 Just by our volleyball court there lay two of the Machaton males, a formidable coalition of three males that moved into our area after the Takazile pride male left during the drought two years ago. 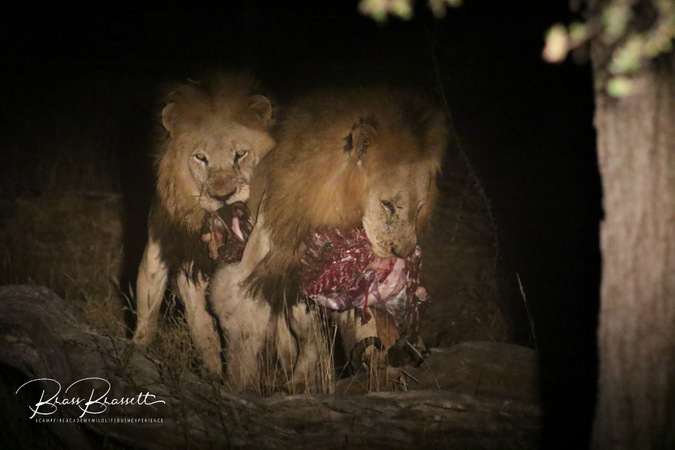 There was not much left of their kill – an impala – and the two males spent the best part of the next two hours fighting over the remains. Whilst the papas were busy fighting, the eight cubs feasted between the two of them, occasionally getting a slap but fearlessly returning to get a share of the spoils. The pride lionesses lay on the outskirts of the kill, and each time one tried to get a look in she was chased off by one the males who then raced back to grab hold of what was left of the impala. Sometimes it was nothing short of comical to watch these two hefty males chase each other round and round a tree! Eventually the third Machaton male appeared, hot on the heels of the fifth female who was in oestrus. The female approached the kill and, with the dominant male in tow, the one lion left the kill and the other wasted no time in running off with the scraps. 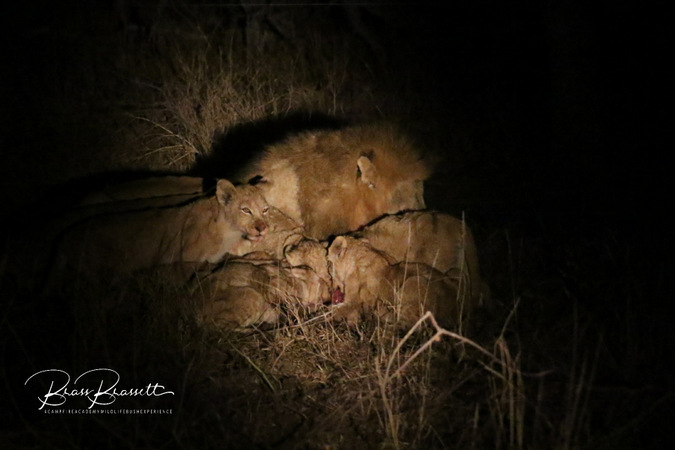 After safely escorting the students back to their rooms, I don’t believe anyone could get back to sleep – with all that adrenaline pumping after the incredible scene that had played out in front of us and hearing the lions calling through the night. As daybreak neared, the calling grew fainter and fainter and by daylight, all 18 lions were gone. All that remained were the most incredible tracks and signs of the awesome sighting we were gifted by our volleyball court! For our FGASA Nature Guide students it was an amazing experience to witness the behaviour of the lions and to store those sounds and smells in their memory bank; to cherish the wonderful drama they will undoubtedly be recounting throughout their guiding career!